The last week has been mildly exhaustive. The move, at the time, was long and drawn out. Now it seems it went pretty quick. We have all of our stuff in the new space, and it will take a while to get it organized I'm sure. But we at least have new space. 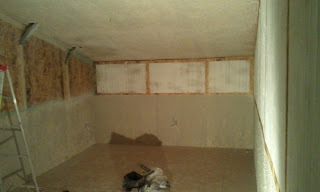 The divider wall is still unfinished sadly, so we share space right now with the fiberglass shop. It reminds me of Les Nessman from WKRP in Cincinnati, with his imaginary office walls! I was glad I was able to do the 3 phase power hook-ups myself, as there were some un-forseen cost associated with the move. 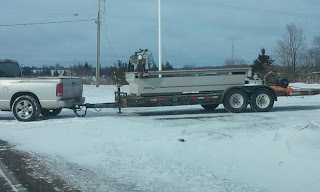 I think it was awesome that it was freezing cold on "Moving the Techno cnc" day. And ferociously windy to boot. The only lifting device available to us was a Bobcat skid steer, and it wasn't able to tilt its forks with the machine loaded on. 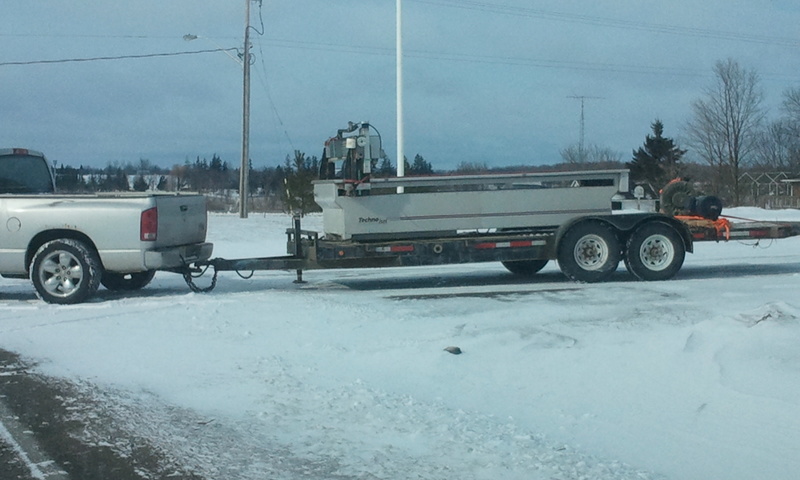 Which puts the machine at around 3000 lbs. I'm guessing. Good times, good times. The rush to move the router was due to a funky new job that came through for us. 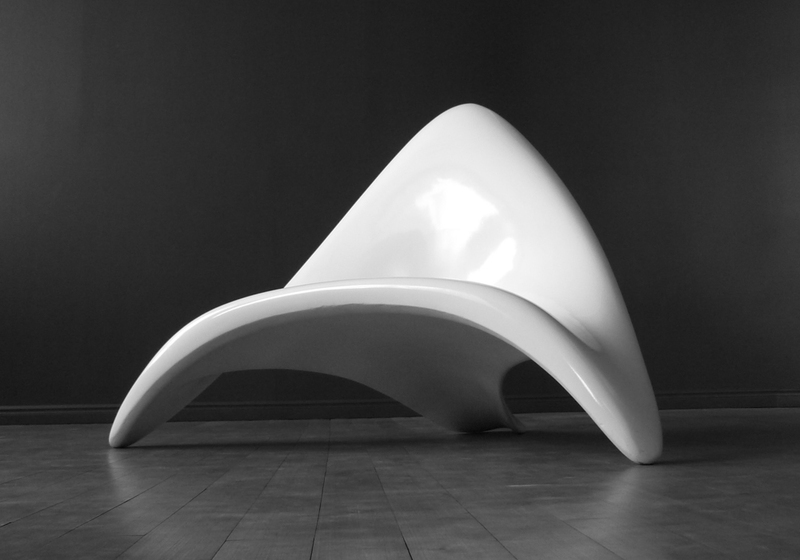 It's a freeform, sculptural chair from Prana Furniture. I knew about it for a while, but the hammer didn't fall until very recently. Designed as a sculptural compliment to the one sitting in it, the chair was originally conceived to accentuate the form of the user, as a womans shoe might her leg. Material is added where needed, and removed where it is not. As a result the forms are honest and derived from the functions that they serve. 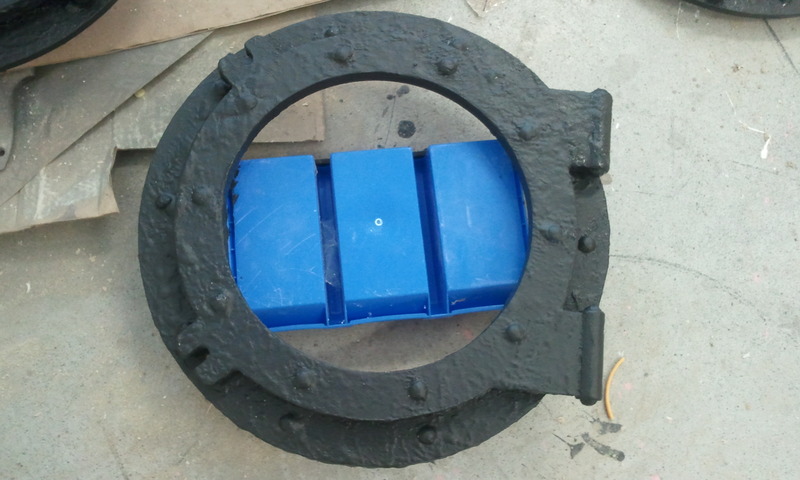 The design possesses an innate mechanical advantage that also provides its unique aesthetic. When placed upon a reflective floor it is apparent that the underside has been considered to the same degree as the rest of the chair. Drawing from a background in life drawing, sculpting, and automotive surfacing, reflections and highlights glide across the surface seamlessly as the eyes observe the chair. 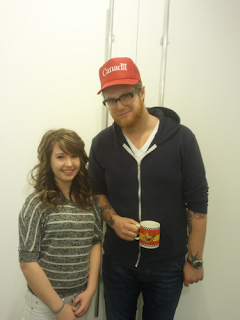 The designer is a fantastic guy by the name of Jamie Ibbett. He has done some great things, most notably working with BMW. After working with him closely on how we are going to build this chair prototype, I think we've got it nailed down. 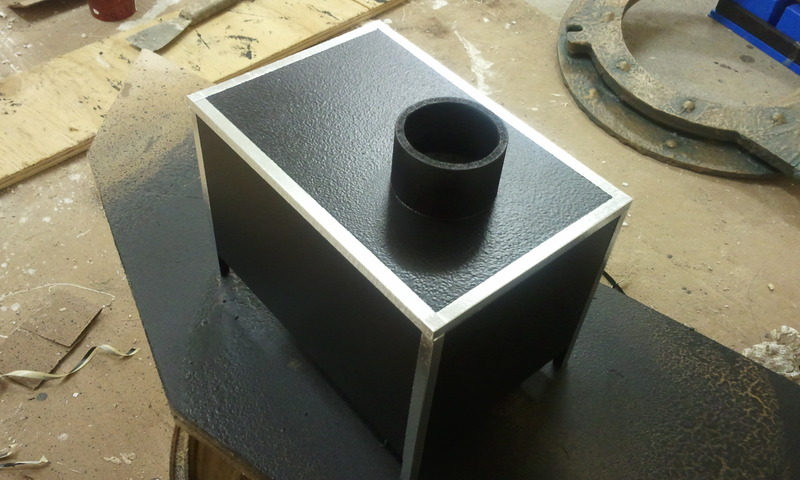 We are going to be using 2" HDU. This will be machined in 2 halves, at which point the new neighbors will be making the molds and pulling 10 fiberglass finished pieces. The neat thing about this chair is it has all Class A, automotive surface geometry, with a huge amount of time being spent on surface reflection. 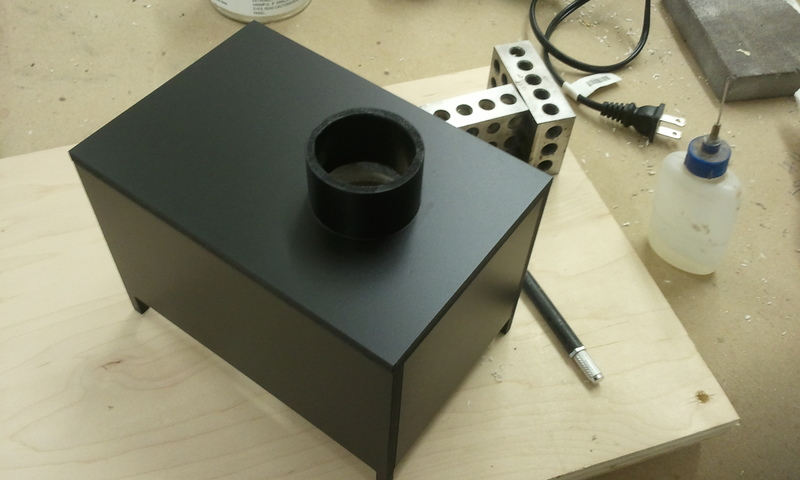 It will certainly be a challenge on a 3 axis router, but I know Techno cnc and Aspire won't be the weak link! 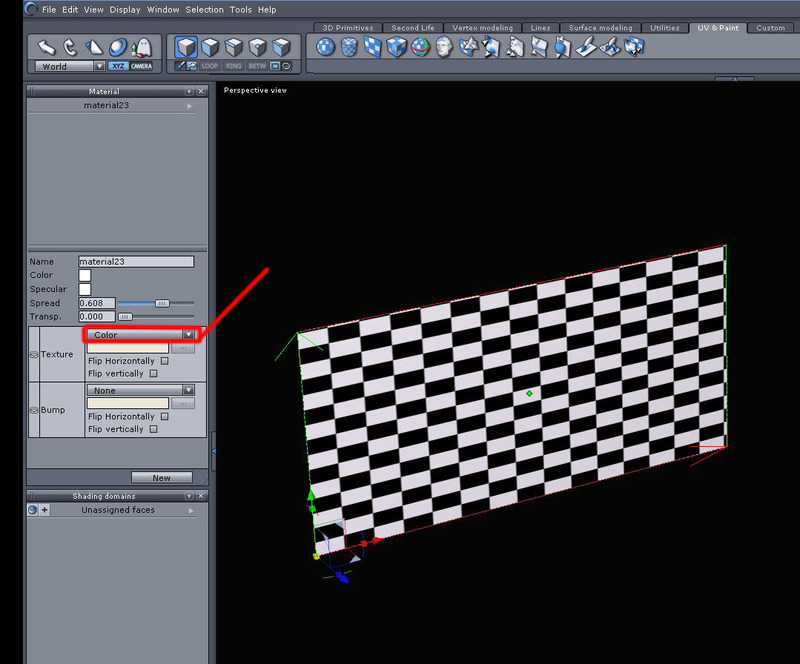 This will be a lengthy tutorial for anyone not interested in modelling in Hex. For the people who are interested, let's get started! Hexagon comes with a basic set of drawing planes ready to go, but this can be almost useless for multi images that absolutely have to line up PERFECTLY, unless you want to start cutting the image up in a photo-editing software. 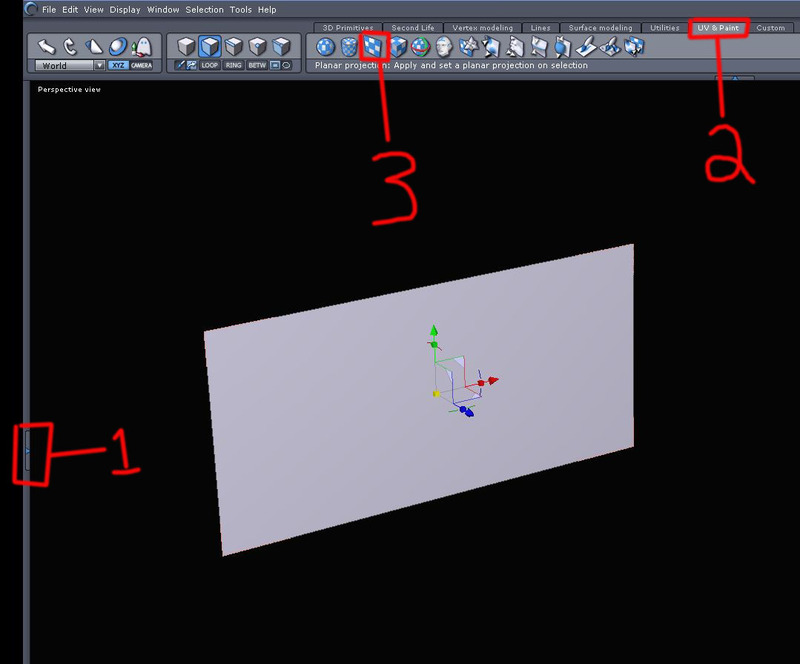 As I am mostly self taught at 3d modelling, I'm not going to say that this is the best, or only way by any means, it's just the way I have adopted. Again, it works for me! 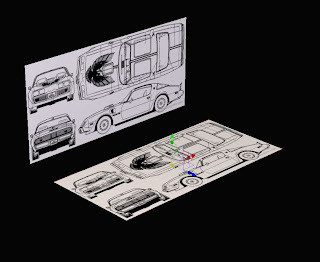 The first step is to get some blueprints for something you want to model in 3d. There are so many places that offer these, they're everywhere, and alot of them are free. Woo-Hoo! I found a set at http://www.pixelcarart.com. Let's get a little 'Smokey and the Bandit' on this one! 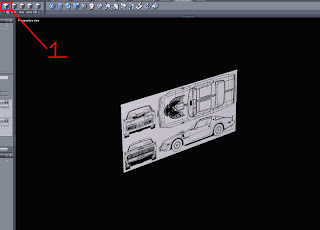 I opened the image in Photoshop, to get a height and width measurement of the image. It was 9.542" X 4.528" You could use any image editing software for this. 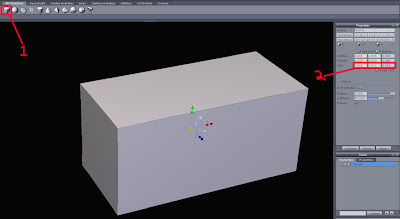 The first step is to select the 'cube' primitive from the primitives menu at the top of the UI. Drag out a cube in the workspace. Any size is good at this point. 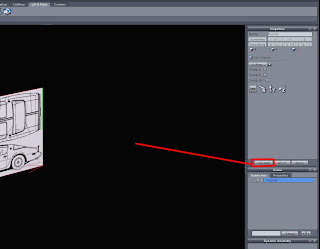 Enter the dimensions of the image into the size boxes in the 'Properties' tab at the top right of the screen. Make sure that the 'Keep Ratio" box is un-checked, this will let us change the sizes non-proportionately. Delete all the faces except for the back piece. This is the one that's going to get our image placed on it. In the 3d modelling world, this is referred to as "uv mapping". It basically assigns image pixels to the geometry we just created. If the 'MATERIALS" docker on the left hand side of the screen isn't open already, select the arrow icon, and it will pop open (1). Now we need to select the "UV AND PAINT" tab at the top of the screen (2). This opens all our mapping and painting tools. 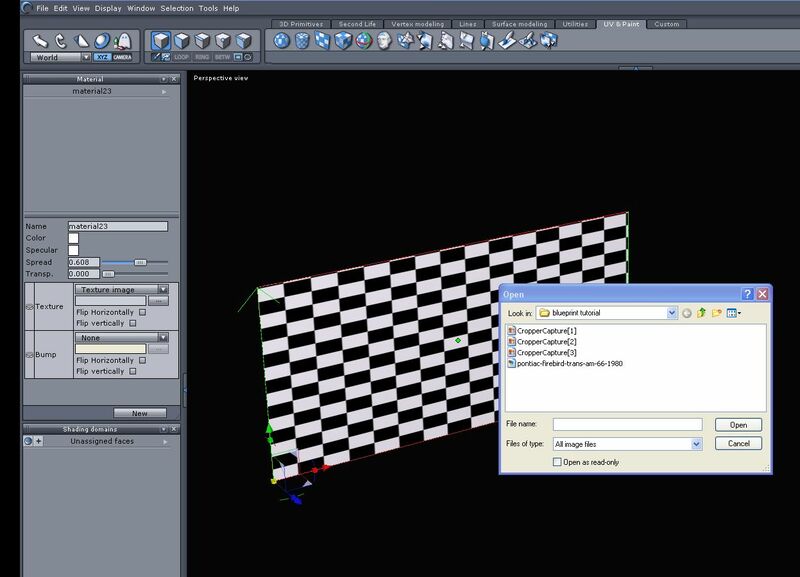 Navigate over and select the 'planer projection' tool (3). From the drop down menu, select the 'texture image' option. 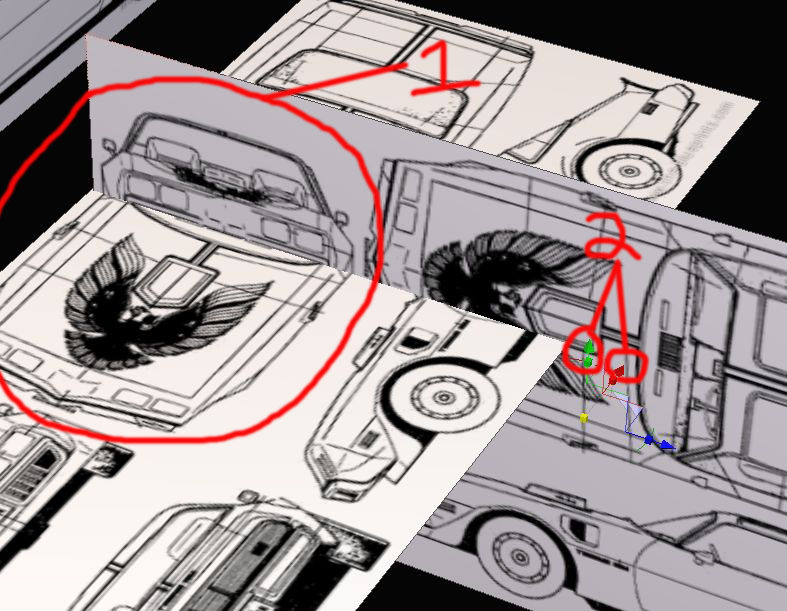 You should get an 'open' file box where you can navigate to your blueprint image saved on your computer. Your image should now appear on the rectangle polygon we created. 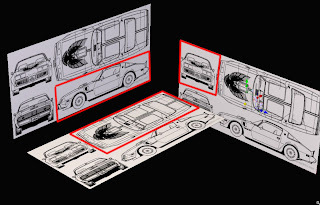 If your image comes in upside down, or backwards, try checking the 'flip vertical' or 'flip horizontal' check boxes until it is facing the right way. The last step we need to do is to "VALIDATE" the operation. Now we select the "SELECT OBJECTS" icon at the top of the screen. 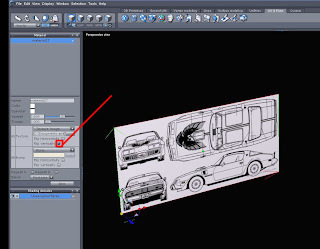 Now that we are in 'objects' mode, select the image plane, then copy and paste it. 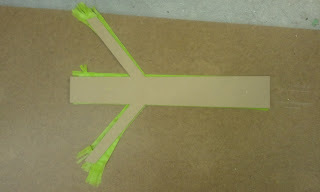 Using the handles on the universal manipulator, rotate the copied part 90 degrees to the original part. Use CTRL+V to paste in a third copy. Again, using the universal manipulator, rotate the drawing 90 degrees. 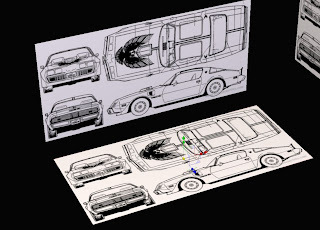 This becomes the front and rear views of the blueprints. If you only rotated the the bottom copy, they will already be lined up. You can double check this in the properties tab, under the 'position' section. Both of them should have the same number in the red box. Now select the side plane and move it into location using the manipulator. Check size and alignment all down the length of the car. Once it is aligned, ONLY move it on the red or green direction. You don't want to mess up your new alignment! These are the aligned views after you have spent some time tweaking them in x-y-z-space. And that in a nutshell is how to align blueprints. No, I'm not getting divorced! The Lawyer sign we did was a huge success. 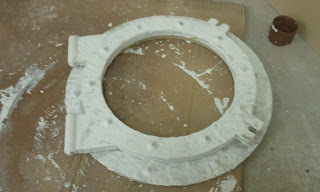 They really liked it, especially as we made the justice scales in full, as opposed to just creating a relief. They have asked us for some more signage, for names and hours and stuff. They also wanted to see some other finish options. So I worked on the weekend drawing up a sample piece for them to decide on. 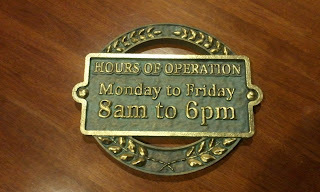 It will also look good hanging in the shop when we get it back. A win-win for us. I have no information on their hours, so I put in ours! I decided that in order to keep a constant design element throughout the signage, I would use the laurel portion. 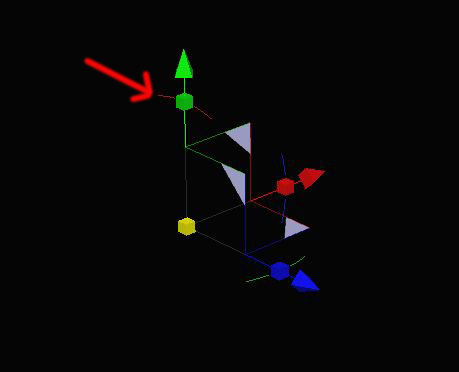 It didn't take long to draw up the shapes in Aspire, as well as add the texture to them. 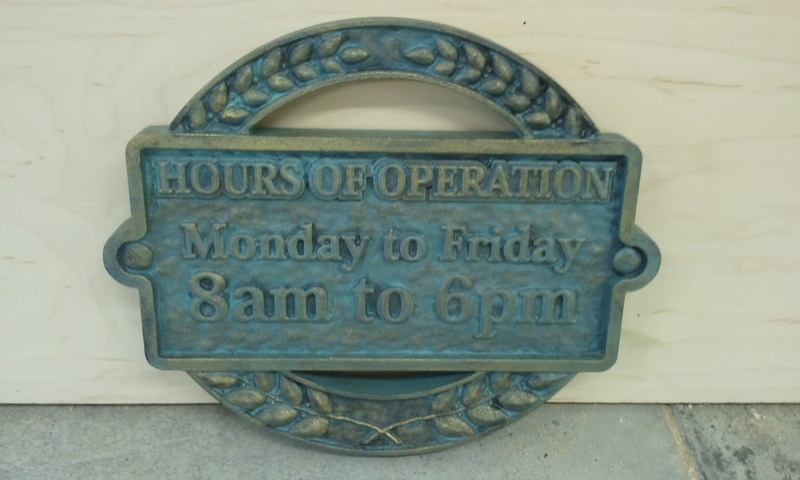 I used my weathered bronze texture for rendering it, to see if I liked it. 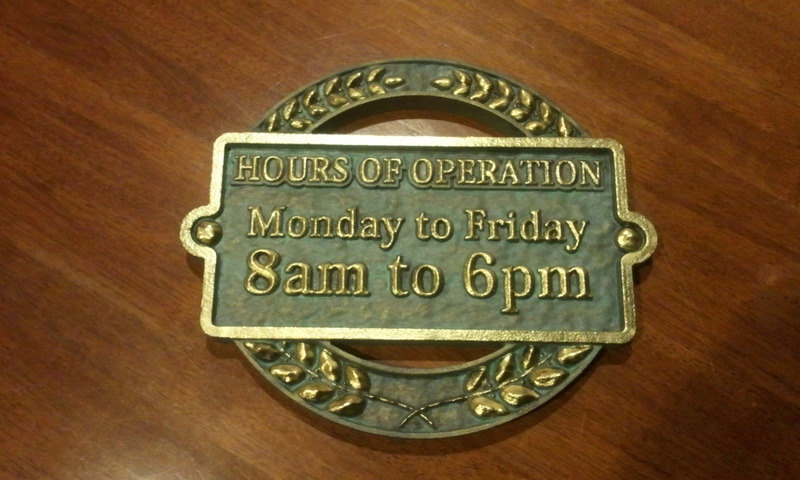 The plaque is 11" high X 12" wide, I cut it with a 1/16" tapered ballnose cutter for the detail and ran it at 300ipm. 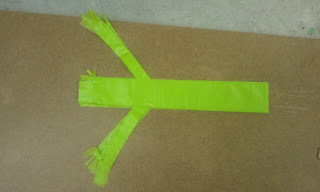 for a grand total cutting time, including bit change to a 1/8" for cut-out, of 65 minutes! Now that's what I'm talkin' about! I was so intent on getting it done for today, I forgot to take progress pictures along the way, remembering at this stage. 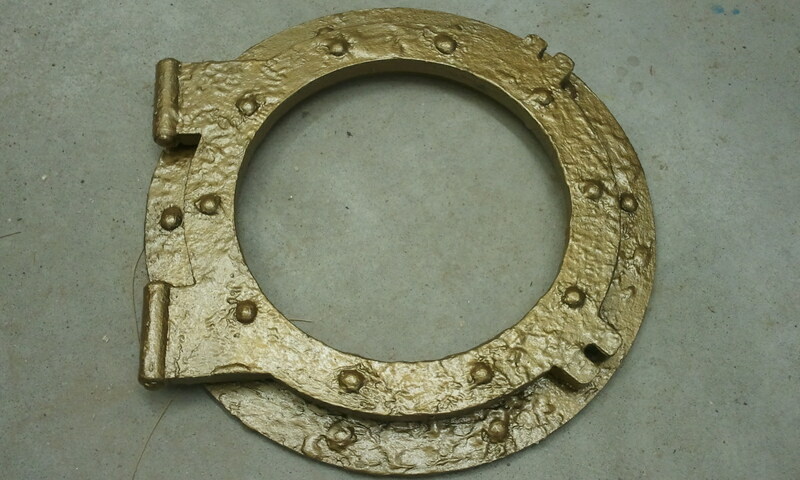 Basically a hammered brass finish, with a couple of glazes for weathering. This was the result when I was done. I think they're gonna like it alot. The polished brass highlights add alot to it. We'll just wait and see what they say! Pretty Fly for a green guy! Today was one of those days that make some of the deadline pressures all worth while. 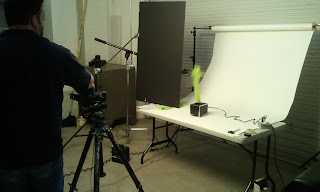 We arrived at the studio with our green fly guy at around 8:30. 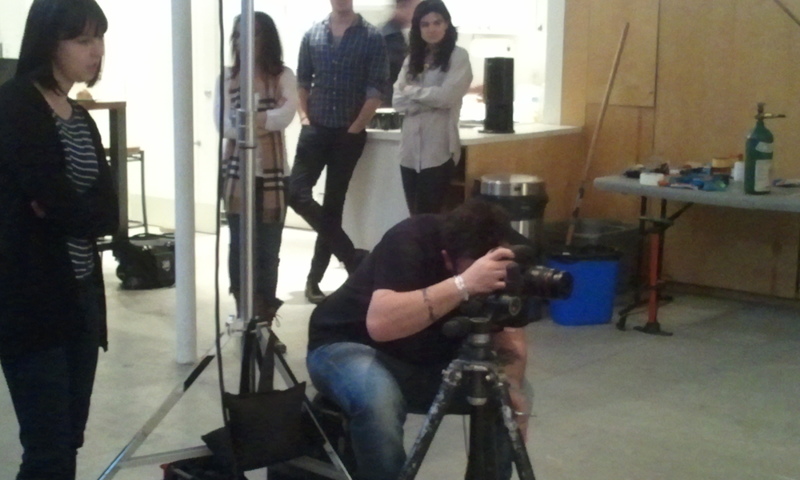 Todays shooting was for the print portion of the ad campaign. I brought my daughter Maddy along with me on this trip. She is super focused on becoming a professional photographer. I thought that bringing her with me to Westside Studio, Canada's largest Advertising and Design Photography facility, would give her a chance to see how the best in the business do what they do. At 16 yrs old, she has been taking evening college courses, to further her learning. Pretty remarkable for a 16 year old I think! One of her photography heroes, Matt Barnes, is rep'd by Westside Studio as well, and was more than happy to take a few minutes out of his schedule to meet her, and pose for a photo. 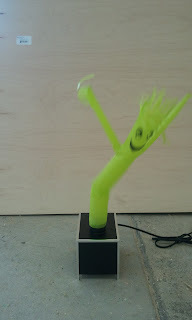 On the business side of things, our Flyguy performed his dancing perfectly! This ad is being shot by photographer extrodinaire, Chris Gordoneer. I have had the pleasure of working with Chris, and his producer Tom Nesbitt for around 5 years now. Out of everything we have done on ANY set, these guys are so easy to work with. They are very low-pressure, and they get great results because of it. There was lots of laughs on set, as everyone was in very high spirits! I wanted to post more photos today, but I have to use some discretion, due to the whole non-disclosure agreement we enter into. Sometimes work can be like hanging out with good friends, and today was no exception! I got to the shop a little early today as I was excited to test the bubble tanks we made yesterday. 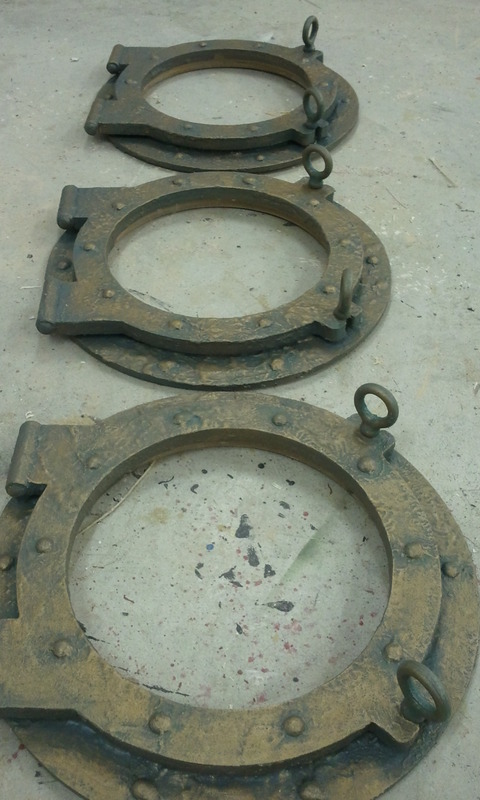 These 3 tanks will go behind our portholes in the new design studio. 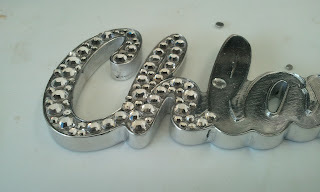 It will look great with tinted water and backlit by the shop lights. I set up the tanks ready for leak testing them, as well as wanting to try out the air curtain stone that will create the wall of bubbles. These tanks are about 18" X 18" x 3" deep. By my calculation, this is 4.2 gallons of water. Now almost 99.9 percent of the time, things go very smoothly at Oxenham Design. However, upon returning to the tank with the air pump, The front wall decided to blow right clean off the full tank. It ended up 5 or so feet from where it was sitting on the table. This was definitely a surprise to say the least. Some of us were paralyzed with fear, helpless to act. I realize now that all silicones are not created equal. The water came crashing across the table, across my Delta cabinet saw, down onto the compressor, and lapped gently across the 3 portholes that were lined up neatly on the floor nearby. I decided that I would clean up the saw and portholes, then go to the new space and install the 200 rivet heads I made into the ceiling, while the shop dried out. Here's the finished portholes just before the storm. I picked up some 1/2" shouldered eyebolts that finished them off nicely! I can hardly wait to install these in-front of what will soon be very heavily reinforced bubble tanks. And from now on, when life throws me a curve, I will just watch the video of our fly guy dancing. I finished up the flyguys today. I just had to add the faces and test the whole rig. It works remarkably well. So here are a couple of stills of the crazy dude in action. I will hopefully upload a quick video tomorrow. I spent most of today designing the mini fly guy skydancer template. This went through many, many revisions. I had drawn the original template in Aspire and cut it from 1/8" mdf. The slow part was cutting and seem welding the very thin material, trying it out, observing how it behaved, then adjusting the Aspire file and cut a new one. We went through 6 revisions before finding one that worked the way we wanted. This was the final design. His arms had to be raised quite a bit more than the real one, as the arms wouldn't fill with air at any other angle. 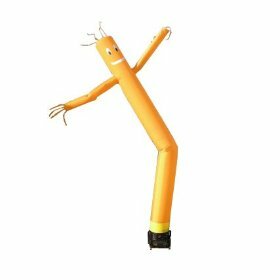 On the real Fly Guy, the arms aren't sealed off, letting the air whip out and shake the finger streamers. Even though the plastic we are using is VERY thin, it still scales out to be WAY thicker than the real material. All this means is that we had to close the arms off so they would fill with air, otherwise they just stay flat and fold on themselves. We welded a separate piece to the end with the finger streamers attached. The tests looked pretty good. The other piece to this crazy puzzle is the base. In real life, the bases vary from being just a fan to an actual road case. As we needed to hide the small hair dryer in the bottom, I opted for the road case look! Over the weekend I experimented with a whole assortment of different fans. But what makes the miniature fly guy successful is the introduction of heat. Without heat, the thin plastic is still quite stiff, but heating the air softens this problem away. A hair dryer it was. However, this was a bit of an experiment as well! We needed the high setting of the fan, but the heat setting on high melts the fly guy. This led to hacking the hair dryer. Every hair dryer manufacturer makes them in their own special way. Some have separate heat and fan settings, some have the heat and the fan tied together, etc. As we went with a travel sized hair dryer for it's size, this proved the worst one to hack. Even though it's a 110v dryer, the fan motor is 12 volts. The resistance of the heater element reduces the voltage to the motor. This means that removing 1 heater coil significantly overloads the little motor. Half a day later, we now have 2 dryers that operate on high speed/ low heat. I know this sort of rambles on a bit, but it just goes to show the amount of work that can end up going into what is a relatively "simple" idea. 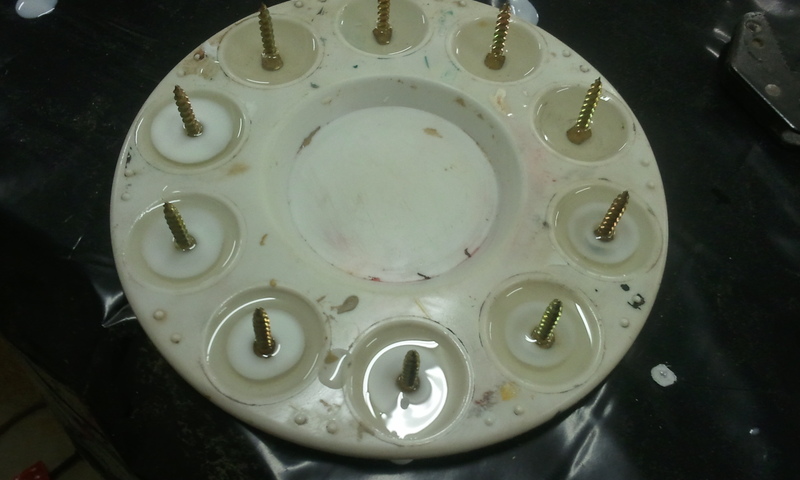 The base was made from 1/4" white PVC. I drew it up in Aspire, carefully considering everything it needed to accomplish. The hair dryer we're using has a small clip-on diffuser with it. I measured up the diffuser and it's clips, then cut a ring allowing our hair dryer to "clip-in" to the inside of the base. We're keeping everything as simple as we can. We have a spare hair dryer, and 10 total flyguys. You never want to hold up anything as expensive as a production team because you came ill-prepared. 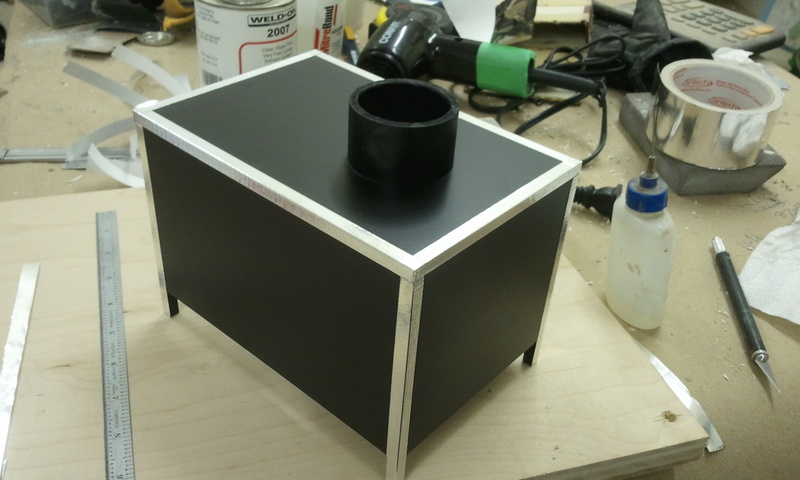 After it was all assembled, I sprayed it out in a black satin color and added aluminum tape to all the edges. This really makes it look like a road case. This base will only appear for a second or two, so going overboard on the detail is a bit crazy. The last thing I wanted to do was add a texture to the black, like a real case kind of has. I masked off the aluminum, sprayed it with a rubberized texture coat, and when that dried, I sprayed it out agian with the satin black topcoat. Very subtle, but I love it! Tomorrow I am finishing up putting the smiley face on the fly-guys and it should be ready to roll. On the porthole side of things for the studio, I have decided to make 3 small bubble walls that will go behind the portholes. This will be kinda cool, seeing the bubbles rise in the windows all day. It's gonna rock! 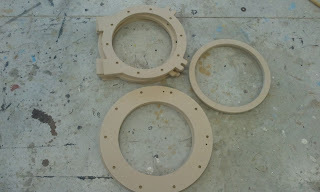 Saturday I started work on the 3 portholes that will go into the wall in the design studio. I had drawn the vectors quite quickly in Aspire. On some jobs, it's a smoother workflow staying in just one piece of software. These are all just 2d cuts in 3/8" MDF. I am trying to use up extra material before the move, so I don't have move sheets of readily available materials. I never get tired of watching our Techno cnc make parts that I designed! The run time was very quick at 12 minutes. I quickly cleaned off the fur from the edges and started assembly. I used up the small amount of doweling I had on the shelf for the hinge portion. 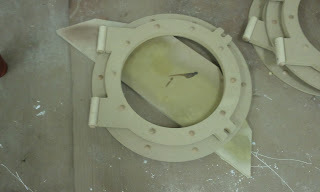 I didn't worry about the gap between the dowel and the porthole as I would be texturing the whole porthole with our plaster/ glue mixture. This mixture is used quite extensively in set and props. It's very durable and a teeny bit flexible, making it ideal and cost effective. Sunday I went in and primed them with a dark dark grey latex, then painted them the bronze color that they will be. They're lookin pretty hot now! I still have to add the eye bolts to them, then add the patina. I will find a bit of time tomorrow for that. We solved all of our R&D issues with the miniature sky dancer that shoots on Friday. It was a bit of a wild ride. We abandoned the cable system as it just wouldn't behave as randomly as the real thing. In the end we are going with just air, which didn't work all that well at first, but we found a more usable material that justs seems to work. 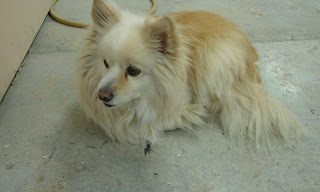 That being said, I think they're going to have to shoot at 72 FPS because he behaves well, just really fast! And as he is supposed to appear at first like he's "full size", he needs to be slowed down. It's gonna be a fun shoot, that's for sure! Well, if you hadn't guessed, we haven't moved yet :( The new place STILL isn't divided into a new spot for us. We are continuing to rent where we are for another month. I have been moving less used tools and supplies to my garage at home. Which is O.K. I guess. I do find that I bring stuff home, then bring it back again, then bring it home. It's a little exhaustive, and frustrating, but we just keep dealing with each day. The bigger tools are organized and ready to go, as soon as we need to get the truck. I am concerned that this might be a huge inconvenience for a lot longer than I would like. We have, however, been making headway on the design space area. Doing bits here and there in the evenings, or around other projects during the day. Oh, it don't look like much right now, that's for sure! 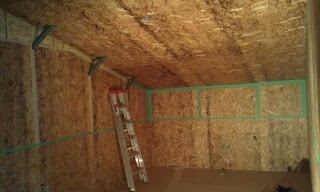 I opted to go with OSB board for all the walls and ceiling. This will allow me a fastening surface anywhere I need in the future. And as we were texturing every surface there is, the substrate doesn't much matter. I decided that all the seams will have riveted plates running down them, so I didn't need to worry about them being taped and mud-ed like drywall. The ceiling is being painted like 4'X8' rusted steel panels with rivets down all the seams. We had a meeting this morning for a neat job, but when I got back to the shop, I started to cast up the ceiling rivet heads. I didn't want to have to make a silicone mold for this, as I can be a little impatient sometimes. So I used one of the many artist mixing trays we seem to have all over. 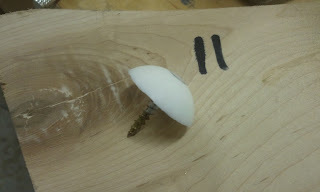 (However, it seems there was only one at the shop, as the rest are boxed up somewhere) I also cast a 1 1/4" wood screw in the center of each one, allowing us to screw them into the OSB where I want them. A little trick with this: Grind flats on 2 sides of the heads. This stops the screw from spinning inside the casting when tightening it down. 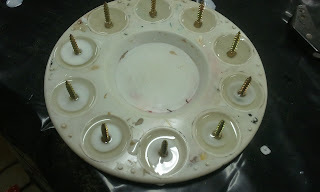 If I had more time, I would have sprayed the paint tray a rusty brown base, then cast the resin into it. If this was going to be in a public place, we would have tinted the resin so the white wouldn't show through if they got whacked. But on our ceiling, they will get next to no abuse. 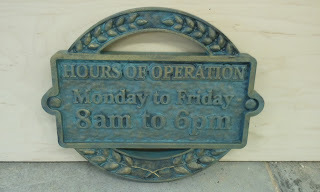 I hope to find the other trays this evening, as I need over 200 of these, and casting 10 at a time is a little slow. 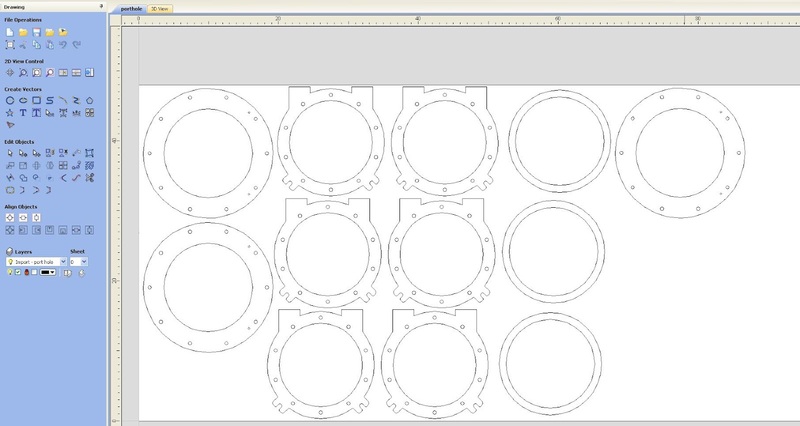 I also got the 3 portholes that go on the one wall all drawn up, and will be cutting those tomorrow first thing out of MDF. The wall that these are going into backs onto the shop side, so with the light coming through the blue/teal acrylic, it should feel very underwater from inside the studio. I wish I could just keep going on the space until it gets done, but work on other jobs needs to keep progressing, so this will definitely be a work in progress for a bit! We got the go-ahead today for a silly little job that's gonna require some thinking, that's for sure! 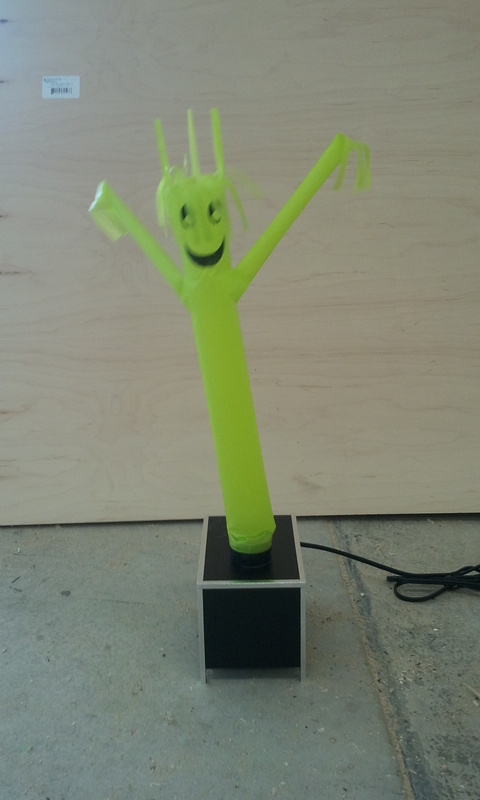 It's a miniature inflatable sky-dancer that has to actually dance. This is for a car commercial. He will only be 18" tall. I know that we won't be able to just scale the real one down, as gravity, air and material thickness don't scale accordingly. We will probably use a cable collapse system, along with air assist to achieve the results. It's gonna be a wild ride, that's for sure!!!! By Saturday night I had Chlamydia! FINAL! 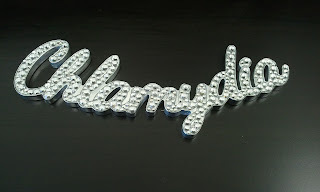 I found the final print spot for our Chlamydia necklace build on the Westside Studio blog! The final looks great! Plus it's kinda fun to creep the Westside blog!!! Saturday I went into the shop to machine the Chlamydia necklace. I should note that this necklace is for a print campaign bringing awareness to STD's. The art department supplied the vector format for us. I had to adjust the size a little to accommodate the size of the diamonds we were using. These are cubic zirconia flat-back diamonds, not real ones. Otherwise I would have just left the country with them and saved all the work! I brought the file into Corel Draw first, as I needed to figure out where all the stones were going to go (there are actually over 200 of them). I could have done this in Aspire, but somethings are better in Corel for me. When I was happy with the way all the stones fit, I exported the file out for use in Aspire. 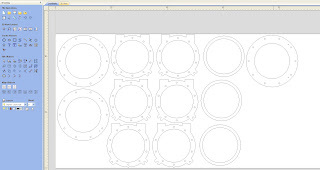 I didn't need the stone layout for machining, so I just deleted them. I decided to mill this from 1/4" T6061 aluminum so I could polish it to a high shine. Paint just wouldn't cut it for this job as it's a fairly tight shot. I toolpathed the center using a 4 flute 1/8" endmill. I probably could have been more aggressive with my step down passes, but chose to take it lightly. The outside profile machining was done with a 1/16" endmill so I could get into most of the kerning. After it came off the machine, I started the painful part of filing the edges with a very fine file to remove all the machining marks. After the edges were flat, I moved to the buffing wheel. The polishing took quite awhile, using the dremmel to get into the tight places was nearly impossible, but perseverance paid off in the end. Today was set aside for laying the stones in. I filled the pocket text with Sherwin Williams automotive clear coat. This has such a high gloss to it. And because it's a urethane product, it's also a serious glue. The working time with it would be around 4 hours, so I could brush it in each letter at a time, then using my labelled stone placement chart I made earlier, I placed the stones in their location. The clear will harden overnight, locking the stones down. It took a very long time to place the stones. I had used tweezers for this task, but some stone would drop and roll away. Some would land upside down in the urethane, which means I would have to turf them, because if the clearcoat gets on the faceted surface, they lose their sparkly bling. By the end of the day the stones were all placed. Tomorrow we are delivering it to the studio. First thing in the A.M. I will mount the rings that the chain connects to, and hook up the chain. This was a really great job to get! I can't believe I get to do this stuff sometimes. I got a sweet notice in my in-box today. It was a notice from Daz 3d letting everyone know that they will be giving away Hexagon 2.5 this month. What a deal!!! This piece of software is very moderately priced at $149, but again, this month it's FREE. We use Hexagon 2.5 almost daily in our production pipeline. I will be honest though, it can be a bit buggy. BUT, save often. There is no faster polymodeler on the planet then Hexagon, and believe me, I've tried ALL of them. The note of interest is that they are also giving away Daz studio 4 and Bryce 7 as well. 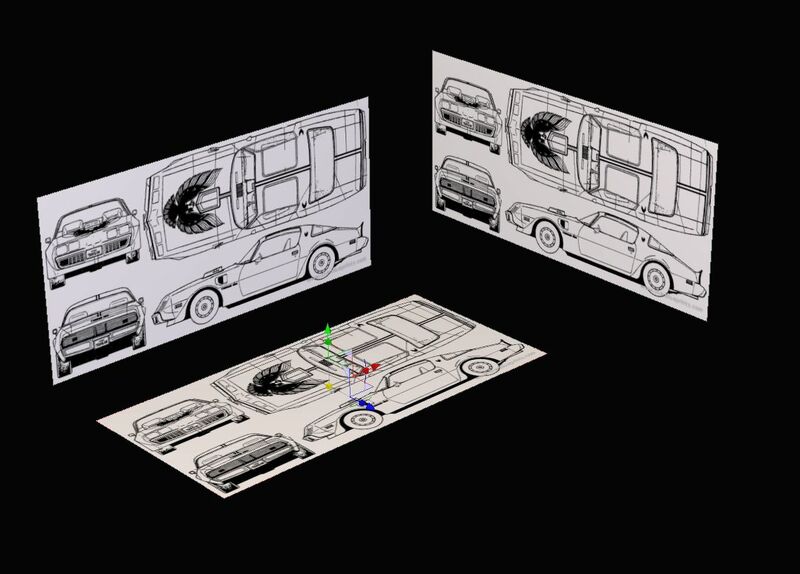 Bryce is a photo-real landscape modeller for movies and photos. Daz studio can be very handy when combined with inexpensive figures and characters that they sell as well. When we did the Yeti job, we used a $20 troll figure and easily posed him using Daz studio. We then exported that pose to Hexagon for slicing into Aspire. Hexagon is just a modeler though. There is no animation, rigging or rendering available. 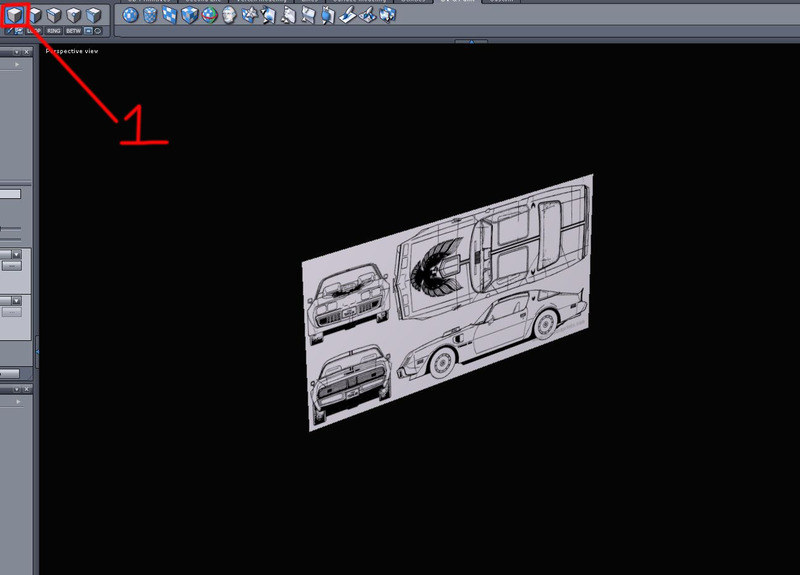 But, as we just model for cnc'ing, all that other stuff would just clutter up the interface. All said and done though, free is free is free! If you want to step up what you can create with your cnc, Hexagon works VERY well with Aspire. There is a HUGE forum, and everyone is just as helpful as the Vectric community. There are also a ton of tut's available. 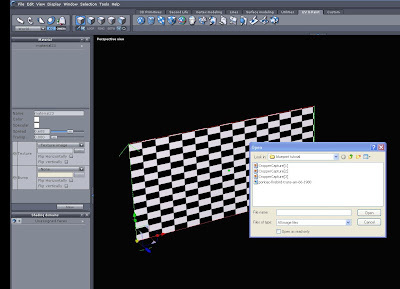 As all polymodelers (or SDS modelers) all work the exact same way, you can use tutorials from ANY other software (once you get a handle on the interface). I would suggest EVERYONE give it a try at least, you can't go wrong!